The first thing you need to know about Harry is that despite his difficult start to life, he’s such a happy little soul. 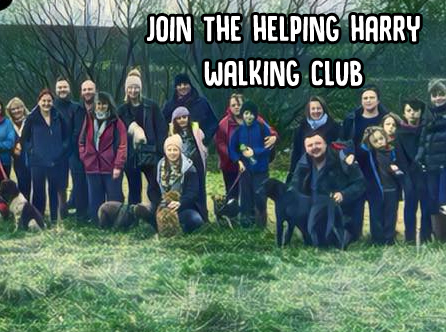 The short version of his story is that Harry suffered severe brain damage and is now severely disabled; he has spastic quadriplegic cerebral palsy and many other complex needs. He can’t coordinate his movements to reach for a toy, hold his head up, or eat or drink without the aid of a tube fed directly into his stomach. He’s not meeting any of his milestones and sadly his list of problems is likely to increase as he grows. When my husband Andy and I found out that we were having a little boy we were just overjoyed, it would complete our perfect little family with his sister Lily being just two years older – a perfect age gap for playing, making them lifelong friends. Andy and I had visions of family holidays, strapping the push bikes on the back of the car and carefree family days out. It wasn’t until Harry’s second day of life that we realised that there was something wrong with our gorgeous little bundle. 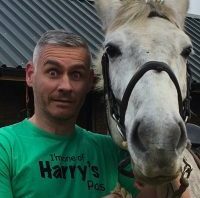 Harry started to have seizures… from then on our world started to unravel bit, by bit. He was rushed down to neonatal where doctors conducted tests to try and fathom out what was wrong with him. From the outside Harry looked so perfect, it just seemed so surreal that this was happening to us- this is what happens to other people. 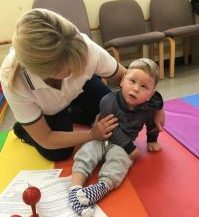 Four days later we were called into a waiting room by Harry’s consultant – his brain scan had revealed that Harry had suffered strokes prior to being born which had caused “significant brain damage”. That was the moment our lives changed forever – nearly three years on and the memory is still as vivid and heart breaking as ever. The consultant couldn’t give us a prognosis for Harry other than what he may be likely to have, he listed these like he was giving us a list of groceries; cerebral palsy, visual and hearing impairments, trouble with speech, epilepsy, feeding difficulties, learning difficulties and even breathing difficulties. Since then Harry has been diagnosed with spastic quadriplegic cerebral palsy; this basically means that he has stiffness in all four limbs because his brain isn’t sending the correct messages to his muscles. He never met any of his milestones physically, and is cognitively around the age of a three month old. 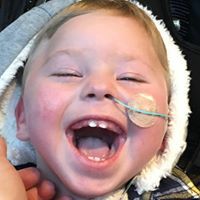 Harry is registered blind, can not swallow properly (resulting in him being tube fed and having breathing difficulties) and has to sleep with an oxygen tank. For Harry this means that he is unable to use any of his limbs to form any purposeful movements. He is unable to hold his head up properly and the poor tone in his stomach and throat means that hehas severe reflux problems and breathing difficulties. Despite all of these things though Harry is a little smiler, he loves cuddles, music and tickles. As a family we are still coming to terms with our new reality and learning to adapt to make sure that we our children the most fulfilling childhood that they can have, it may not be what we imagined but day by day we are growing stronger and more resilient.